CNN Money article on how big energy companies are not the only organizations losing out on falling oil prices - some banks are in trouble & will feel the fallout .. recall in 1986 when falling oil prices forced hundreds of banks to shut down in Texas .. "Cheap credit helped fuel the U.S. shale boom, allowing countless energy companies to find oil in new places. Banks also capitalized on economic booms in oil-rich regions like Texas and North Dakota. 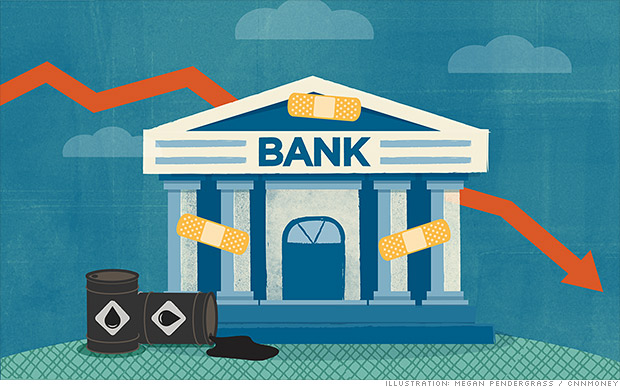 It would only make sense for these same banks to feel some pain from oil's downward spiral .. Drilling projects that made sense at $100 may now be losing money, creating headaches for the lenders that financed the expansions. Some highly-leveraged shale companies may even go belly up due to the plunge in oil prices .. Bank losses likely to grow: If the oil plunge causes certain economies to stumble, banks are likely to be hit by higher credit losses and a slowdown or even decline in loan growth."